Different Times, Different Climes, Different Crimes! George Alfred Henty, 1832 – 1902, History Teacher? Was Sirhan Sirhan a Programmed Assassin? Is Reading Dead? Not for 150,000 Who Thronged the L.A. Times Festival of Books! Book dealer software – a progress report from ammonet. In August 2001 the FBI appeared in Arundel Books’ Los Angeles store with a US Justice Department subpoena demanding 6-1/2 years of customer records from our entire company. We fought John Ashcroft, Robert Mueller, and the US Government. We won. Two weeks ago I paid off the last of the legal fees, and celebrated by publishing a poetry magazine (more about that below). You can read more about this case on-line by searching sites like that of the New York Times, Washington Post, Seattle Times, Los Angeles Times, etc. (CNN did a special on this, but access is a problem, and Roll Call, the Congressional journal, has a site index I have not mastered). But if you run a bookstore I will try to give you the stuff you need to know. Disclaimer: I’m a bookstore guy, not a lawyer. But this is what worked for me. Second, do not keep info about your customers, their interests or preferences (yes, the subpoena will ask for this), if it would embarrass your customers. If your customers think that their reading habits will not be private they will not read controversial books (this is called the “chilling effect”). Second: Join or send some money to ABFFE (American Bookseller’s Foundation for Free Expression). Trust me, you’ll be happy you did, because these are the folks who’ll help when you need it. Visit http://www.abffe.com for more info. 1. Be respectful and polite. Odds are the people you meet are not the ones who thought this one up. Tell them that you will comply with “any lawful subpoena” (which you will be fighting) but that it will take some time. Be aware: the Feds have served fake ‘supoenas’ before (in the Tattered Cover case). Make sure your staff knows who (you) is the only person who can handle this stuff. 3. Judges do not review subpoenas before they are issued. Federal and local prosecutors frequently over-write them (making them so broad that they are unlawful) figuring that you will negotiate. DON’T NEGOTIATE. The more absurd they are, the easier they are to fight. 4. Call ABFFE, your local ACLU chapter, and Judith Krug at the American Library Association. 5. Draft a press release and send it out. Local, state, and national. Stress universal themes (not your own issues), and how this situation threatens not just Constitutional rights but the liberties and freedoms that are our inheritance from the Founding Fathers by way of the blood, sacrifice and patriotism of our forefathers. 6. Make it politely clear to all the Government types that this is going the distance and that this will NOT be the case that gets them promoted. 7. Be smart, keep your nerve, get the help you need, and WIN. And then, when the bills are paid, do something to celebrate. 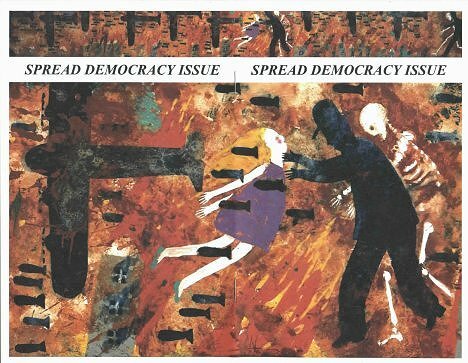 My celebration was to be the guest editor of a Special Issue of “Spread” magazine: the “Democracy” issue. There’s nothing like a little oppression to focus your patriotic commitment to democracy and free speech. I was able to get some Pulitzer Prize and National Book Award winners to join in: Philip Levine, W. D. Snodgrass, Charles Bukowski (unpublished work courtesy of the estate), Robinson Jeffers (courtesy of the estate), and a long list of others. The cover art is by DeLoss McGraw, whose Alice in Wonderland (Harpercollins), won the 2001 Gold Medal from the New York Society of Illustrators. $5 mailed gets you one from orders@arundelbooks.com. You’ll notice that I have not mentioned the “USA Patriot Act.” The portions that pertain to bookstores have not been reviewed or upheld by a court and, as I personally believe they will be held to be unconstitutional, Arundel Books would act accordingly. Hint. I believe that this period of difficulty offers all Americans an opportunity to rediscover the history of our great nation, and of the true meaning of the rights and liberties handed down through generations from the Founding Fathers themselves. 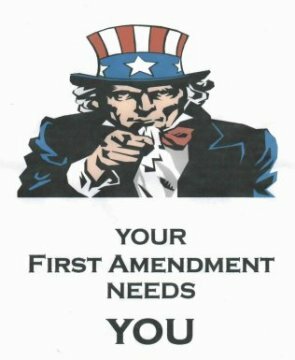 And please remember: your First Amendment needs YOU. Spread: The Monthly Journal of Poetry has just released its Democracy issue, guest edited by Phillip Bevis, and underwritten by Arundel Books of Seattle and Los Angeles. This special issue of Spread is dedicated to Democracy and to the rich traditions of Liberty and Freedom of Speech which are the birthrights of all Americans. This issue includes celebrated names who have won the Pulitzer Prize, the National Book Award, or who have been on the cover of Time Magazine, as well as emerging voices who we hope will reach equal fame one day. Authors include: Philip Levine, W.D. Snodgrass, Charles Bukowski, Robinson Jeffers, Jose Montoya, Holly Prado, et.al. Cover art (Alice in Wonderland and the Bombing of Innocence) is by DeLoss McGraw. Local Seattle writers represented include Michael P. Smith, Ira Parnes, Eli Richardson, Lawrence Coffin, Nicole Sarocco, and Harvey Goldner. The poems in this issue speak passionately of the freedom and rights of the individual, of the blessings and responsibilities of Democracy, and of the pride and heartbreak of being American. Collectively these works offer a tribute to the heritage and traditions of a great nation. This issue was underwritten by Arundel Books. Arundel Books is one of the few booksellers in America to oppose successfully John Ashcroft’s Justice Department during one of its many crude attempts to trample constitutionally-protected rights. Phillip Bevis, c/o Arundel Books at (206)624.4442 or mrarundel@arundelbooks.com . Spankstra Press P.O. Box 224 Seattle, WA 98111. E-mail to: spankstra@hotmail.com . Please note: While Spread is free, there is a $3 (or $5 by mail) suggested donation for this issue.